In that bowl I had grapefruits, lemons, mandarins, oranges and tangerines. Apparently I was under some misguided notion that I would eat a lot of citrus in the new year. Before they dried, wrinkled and got that awful rotting citrus smell (it lingers so), I decided to turn it all into marmalade and knock off the first challenge. 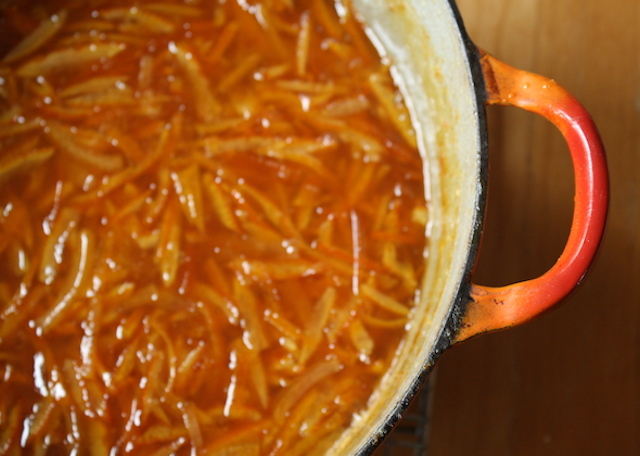 I used my friend Cathy Barrow’s Texas Marmalade recipe as a guide and it was damn delightful. The recipe is pretty simple – citrus rind, citrus juice, sugar, water … and one chile pepper. Just one. It doesn’t add any perceivable heat but tends to pump up the other flavors. I like it and I also wouldn’t be opposed to maybe adding a few more chilies for a bit more heat. Maybe next time. Now I have to admit, I read the recipe wrong and ended up doubling the juice. This was aggravating because I had to juice a few more pieces of fruit than I had used for the peel. The recipe called for 2 cups juice, I measured 4. Whoops. So I adjusted the water and then ended up using even less than what was called for. In the end, though the recipe called for 10 cups of juice/water, I ended up using 8 cups total. The mixture was perfect – very fruity and thick and packed with lots of chunky peel, just how I like it. Had I used the full amount of liquid, I suspect it would have been a bit thinner/jelly-like. The one thing I can never quite come to terms with is preparing the citrus for marmalade. This recipe has you juice the fruit, then remove and discard the pulp and slice the rind. Would leaving the pulp in the mixture make that much of a difference? Probably not but over the years, my marmalade prep method has evolved. Now I cut the rind off the fruit first, as if I’m going to supreme the fruit, and then juice the naked fruit. It’s a bit of a mess as the fruit disintegrates while juicing and there’s a lot of squeezing going on but I like being able to control the amount of pith. If the pith is thick, like on grapefruits or some oranges, I can leave some of that behind, cutting back on the bitterness. To each their own I guess. STRESS THERAPY BAKING FACTOR: JARRED SUNSHINE. Seriously. These little jars hold a whole mess of citrusy sunshine. I like a really chunky, rind heavy marmalade that isn’t too sweet but not overly bitter either. This is it. I can’t quite explain what that one, single chili does but it works. It all just works. 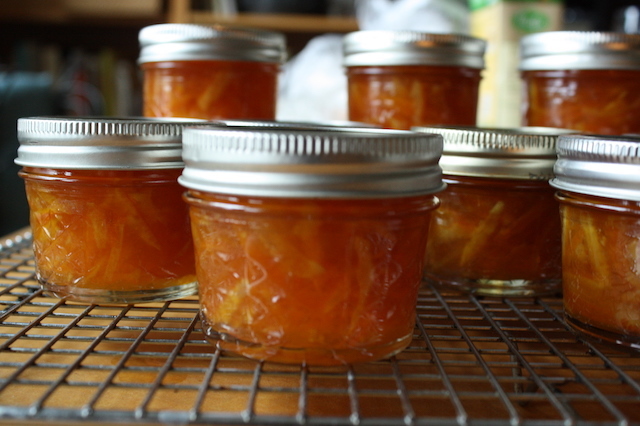 So round up those random oranges or that big bag of clementines with two missing that you bought with good intentions and make some damn marmalade. The original recipe says the yield is 6 8-ounce jars but I got 4 8-ounce jars and 6 4-ounce jars. Go figure. Use any combination of citrus you like – grapefruits, oranges, tangerines, lemons, limes even exotic things like Buddha’s Hand if you like. Prep and soak the citrus: Slice the top and bottom off the citrus, place cut side down and with a sharp knife, cut the peel off leaving the flesh as intact as possible. Place the fruit in a bowl and set aside until needed. 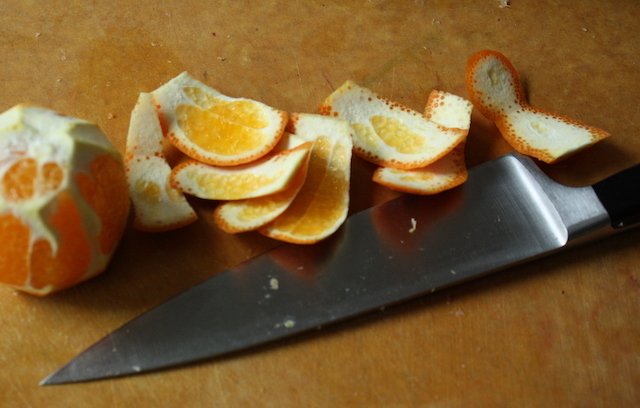 Cut the peel into thin slices no more than 1 ½” long. Place in a large heavy bottomed 5-quart pan. Cut the fruit in half and juice with a reamer or a really good squeeze to measure 4 cups total. You may have to top off with additional juice if needed. Add the juice to the pot along with the water. Give the peel a stir, cover with a plate to keep the peel submerged, and place the lid on top. Let sit for 8-24 hours. Note: if you don’t have the right size plate, cut a round of parchment paper slightly larger than the circumference of the pot, place on top of the fruit and place a plate that will fit on top. You want to keep the peel submerged. Start cooking: Remove the plate and add the lemon juice (from the 2 lemons) and chile. Place the pot over medium-high heat and bring to a boil. Reduce the heat to low and simmer for one hour, uncovered, until reduced by one-half. The peel should be tender. Stir in the sugar, clip on a candy thermometer and increase the heat to medium high. Continue stirring and bring the marmalade to a boil. Heat to 220°F. It will go to 215°F quickly but then take a while to reach 220° Have patience and keep stirring so it does not burn. At 220°F, turn off the heat and move the pot aside and let rest for 20 minutes. Stir well. The fruit should be suspended throughout the gel. Ladle the marmalade into hot, clean jars, wipe the rims, top with the lids and rings and process in a boiling water bath for 10 minutes. 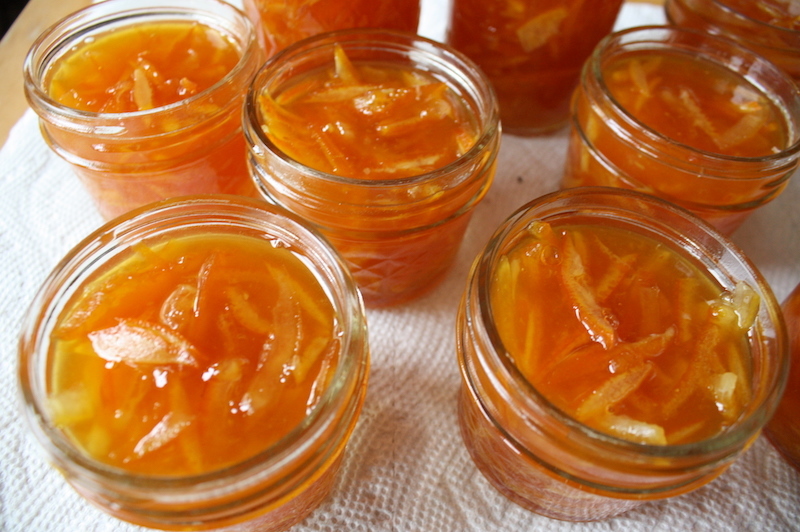 The marmalade is shelf stable for one year. love the idea of putting a chile in it. I get it. Prepping citrus for marmalade is such a pain! But I’m so glad that you feel like the finished product is worth it! Beautiful, and that chile would be a fantastic touch.